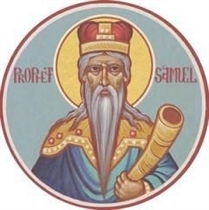 The day of Prophet Samuel - Name day of everyone named Samuil. Samuel was born to Hannah after a lifetime of barrenness and tears in prayer. He was dedicated to the Lord and trained by the chief priest. He is considered the last of the Judges and anointed Israel's first two kings, Saul and David. Samuel organized and led a school for the Prophets. His banner reads: "Yes Lord, your servant is listening." This refers to his call from God to be a Prophet to Israel.